Recently, I received a letter from a woman who was getting mad at her automatic negative thoughts (ANTs) thinking this would help her get rid of them faster. This, of course, is not true. You can't overcome social anxiety by using aggression or anger. It's understandable she felt this way. The automatic negative thoughts have bothered us and caused us great emotional pain for decades, so wanting a quick release from ANTs makes sense on the surface. I had to remind her that the ANTs only go away as we calmly call their bluff -- as we calmly catch them, label them as irrational, and dismiss them. Anger or any other negative emotion thrown into the situation just reinforces the ANTs, so it's important that we handle overcoming social anxiety in the right way. That, by the way, is why we systematically go through these strategies in our groups, and in the series, because one strategy that we learn builds on other strategies, so doing them in a special order is the only way to have it work. The main point of group therapy or use of the audio series is that the strategies we learn can be used in practical situations, in the world you currently live in. Fighting fire with fire makes the fire stronger and burn brighter. Fighting fire with fire is not a way to put the fire out. Anxiety is a negative emotion. You cannot overcome social anxiety by using another negative emotion, like anger, frustration, depression, irration, or aggression. These negative emotions only make social anxiety stronger. Aggression against your anxiety doesn't work. You are just more irritated and upset afterwards and, if anything, you've made your social worse. You haven't solved any social anxiety problems. Anxiety doesn't respond to negative emotions. That's why it's almost impossible to get over social anxiety on your own, and why it is a vexing problem. You think you're doing the right thing by getting mad at your automatic negative thoughts (ANTs), but you are doing exactly the opposite thing that you need to do. This is spelled out thoroughly in the audio series starting with "The Fighting Paradox", which fully explains this paradox, and continues on through the "Acceptance" handouts. All solutions to social anxiety involve paradoxical, counterintuitive strategies. Learning these paradoxical strategies, and implementing them in your life in the appropriate way, is what helps us overcome social anxiety. You can't fight fire with fire. You can't FIGHT anxiety at all, in fact, because fighting (a negative emotion) does not work. Anxiety does not respond well to other negative emotions. You can't fight, battle, or attack anxiety and have it work. Anxiety changes as we use positive emotions against it, in a systematic manner (this is more fully explained in the series) -- such as calmness, peace, relaxation, and rationality. As we stop using negative emotions and start using positive emotions, like calmness and peace, we learn to overcome social anxiety disorder. Other negative emotions include things like pressuring ourselves and trying TOO hard with the therapy. Trying too hard is pressuring, and pressuring is a negative emotion. The therapy itself must always come from calmness, peace, relaxation, and acceptance. 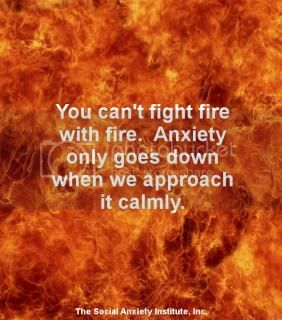 Anxiety hates it when we stop fighting fire with fire. The ANTs love the fire, but they hate it when they can no longer make you sweat and squirm. What's Included in the Series "Overcoming Social Anxiety: Step by Step"